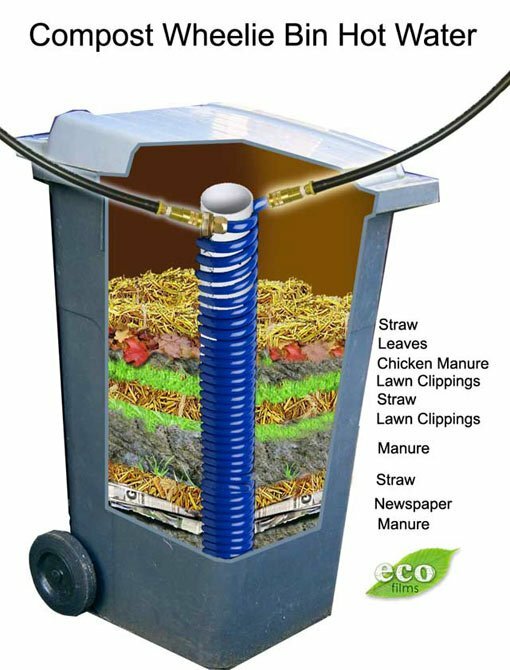 Compost can reach a core temperature of 70 degrees Centigrade. Conventional Hot Water systems are thermostatically set to heat the water to around 65 – 70 degrees centigrade. So at its peak this system will create very hot water for free. Just a note...The amount of heat created by a compost pile or bin in this case, can be controlled somewhat by the ratio of green(fresh grass) to brown(twigs). Too much green though and it can start to stink. But since the idea above will be used in winter, the odor will be diminished by the cold. I wonder too, how well this would work in a bin with no ventilation. I suppose a PVC pipe with holes drilled in it could be pushed down to the bottom. At the dog park a couple of winters ago the city brought is several dozen huge piles of wood chips. The piles were never spread out until late the next spring. All winter long these piles had steam rising from them and they never froze. Gregg your link takes me to a search page with no parameters filled in. I suppose it would help if I copied the link instead of the search. Try this. I am just curios I have few coils one 100 feet oxygen barrier and one 200 feet pex-al-pex from pexmall.com is okay use them together? Anyone have experience make this system? Any thoughts? What for a good idea. Next day, the lid blew off, a foot into the air, as I happened just to be in the vicinity - pretty spectacular & noisy sight! This got me thinking "methane", so I added a few gallons of water and put some rocks on the top, then replaced the lid & weighted it with a big rock. (If I am not back on here, reporting, within a few days, the thing has exploded on me, and I will have changed phase, from solid to gaseous...).